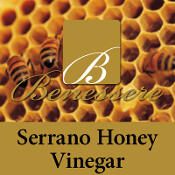 Our Spicy Serrano honey vinegar is especially delicious drizzled over sliced tomatoes, and fresh mozzarella cheese. Pour over leafy greens, potatoes and pasta! It also makes a wonderful marinade on chicken and in chili. Sweet, tart and made from 100% honey. Delicious and distinct, it adds mellow flavor to salads, pan sauces for roasted meats, seafood, and vegetable dishes. Can be used in place of traditional grape-based balsamic vinegar.